From The St. Louis American: There were many ideas put forth Monday, November 27 for the million-plus square feet of property in North County that used to be Jamestown Mall – but the same old mall was not one of them. “That’s it – pretty much what she said,” her friend said, as another lady nodded in agreement. For those not inclined to visit the Galleria or to head west, they shop via the internet. “Right now, most of it is online,” one resident and shop owner said. “I am more of a T.J. Maxx and Marshall’s girl,” another chimed in. 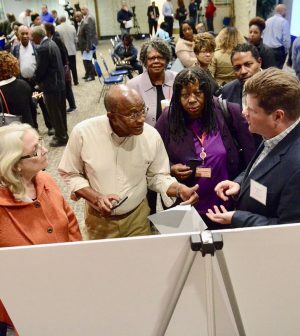 The St. Louis County Port Authority, St. Louis Economic Development Partnership and St. Louis County held an open house at the Detrick Building at Christian Hospital to present a visual overview of the Jamestown Mall site and surrounding area, including community demographics, tasks the Port Authority wants developers to perform, and to seek public input on the next steps. Many are looking for some type of mixed-use development – higher-end retail, senior housing, a decent hotel, entertainment and recreational activities. Some want manufacturing to bring in jobs to take the strain off the existing tax base. Others just want to see something, almost anything other than letting the site continue to deteriorate.